Thanks to loyal reader Ouija Broad for offering up this review for your reading enjoyment! This book is like rummaging around in the $1.00 bin. There's a lot of junk, but keep looking and you will find some valuables. * This is the most complete portrait of LVH that I have read, at least a well-rounded portrait of who she was at the time her involvement with Mr. Chiaramonte. Through her correspondence, a picture emerges of a woman who is warm, earthy, kind, and devoted to her friends and family. * Mr. Chiaramonte makes some astute points about the how and why LVH is still incarcerated, specifically citing the politics and fiscal concerns that may keep her in jail for life. * In “Restless Souls”, Stephen Kay is a tireless fighter of justice. In this book, he is a wormy, often confused opponent who fights dirty. * Two letters from Charlie Manson to LVH are clear insights into the manipulative mind of CM. His letters reflect a barely literate man who is a master of manipulation and mental mind games. The most interesting part of the letters is the lack of goofy ramblings associated with “Crazy Charlie.” Here, he means business and gets right down to it. * This book tells us more than we ever wanted to know about Peter Chiaramonte. It should have been titled, "The Autobiography Of A Man You Have Never Heard Of, plus some stuff about Leslie Van Houten." I admit I skipped whole pages of details about Mr. Chiaramonte's life and friends. * Mr. Chiaramonte meets LVH's family - mother Jane, father Paul, siblings Paul, Jr., David and Betsy. I wanted to hear more about them and how they feel, but Mr. Chiaramonte's speaks of them only as props to his own story. * There is some incorrect information in the book. For example, Mr. Chiaramonte cites that he "read somewhere" that Tex Watson dropped out of high school. Not true. There is also unsubstantiated claims that he just throws out with no reference, such as citing LVH as being so smart that she is considered to be in the top 5 percent of Americans. Really? How did he come up with that? * The writing: Mr. Chiaramonte melodramatic prose can be cloying. At best, it sounds like a school boy in love. At worst, it sounds like a Taylor Swift song. Was the book worth the money? I think so, for the gems it does reveal about LVH. Again, though, you will have to wade through a lot of junk to get to the gems in the book. It sounds like much of the book left Ouija bored. The tagline - 'my tragic romance' - can Ouija tell us what exactly was tragic abut the romance? Or is 'tragic' in this case shorthand for 'lucrative'? Ouija, if there's a lot of junk can you spare us the time and give some examples of information on LVH personality? Did he says anything about the murders day? I'll see the author one and raise him two regarding the super smartness. As a youngster, she spelled phonetically. I've got her Monrovia-bible to prove it. Ah, let's bring the gossip. Michael, yes, I was bored with the parts that dealt strictly with the author. It seems to me if you are going to use LVH's name in the title, that's who should be the focus of the book. 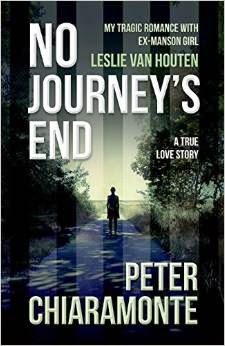 In this case, the author believes the love story between him and LVH was "tragic" because they were in love but could not be together due to her life imprisonment. CrisPOA: the author first corresponded with LVH via the mail. When she was out of jail for a brief period in the late 70's, he flew to CA to be with her several times. In regards to the murder of the LaBianca's, per Mr. Chiaramonte, "LVH and Pat struggled to restrain Mrs. LaB. She escaped, Pat stabbed her several times, and "Leslie let go of Mrs LaB. and fled the room, frozen in shock...she has no memory of watching Mrs. LaB dying. ..Tex could see that LVH was hesitant to take part.....so he grabbed hold of her arm,spun her around, put the knife in her hand and screamed at the top of his lungs, "Do something." WIth Tex standing over her....LVH took the knife and began stabbing the lifeless body." CrisPOA: one of the most frustrating parts of the book are passages like," I spent the evening with Leslie's mother, and we talked about Leslie's childhood." Then he changes the subject, giving absolutely no information about what, exactly, was in the conversation. There were multiple opportunities with LVH's family where light could have been shed on LVH's past and personality, but, as I stated, the family is mentioned mostly as props for his story. Mr. Chiaramonte's take on LVH's personality, as seen through the lens of someone who believes he is in love, is that she is warm, thoughtful, kind...an earth mother sort who just wandered in the wrong direction. 3) Sinatra was good in bed . Catori Grant, I agree. That book was so bad I can't bring myself to waste the keystrokes to review it. Oh man i hate when people say they had a conversation with someone who could bring a light into the personality of someone in discussion - like say something relevant or what has been said, but they do not. Maybe it's because nothing had been said? Sometimes the details you don't care speak volumes. I've read the book and It was, in some sense, a good source of information. Mr.Chiaramonte does a good job showing the softer side of Leslie, But the book was mostly about Mr.Chiaramonte's life. I, personally, liked it on some levels. I was also very frustrated that he didn't include more information about Leslie's family. It made no sense to say you've talked to someone but not bring up what you've talked about. In my opinion, It was a good book. Just way too much information about Mr.Chiaramonte.